Perch Design Team/Hans Thyge & Co.
Sedentary life is slowly killing us. We were born to move continuously, so it’s no surprise that children in school find it difficult to sit still. Designed after six years of research, the patented RAY chair promotes full-body, continuous and high-quality movement for students. Active, dynamic sitting, neutral lumbar curves and significantly reduced stress points are all achieved from an increase in sitting heights and forward rotated pelvis. Aesthetically, the design is clean, contemporary and exciting. 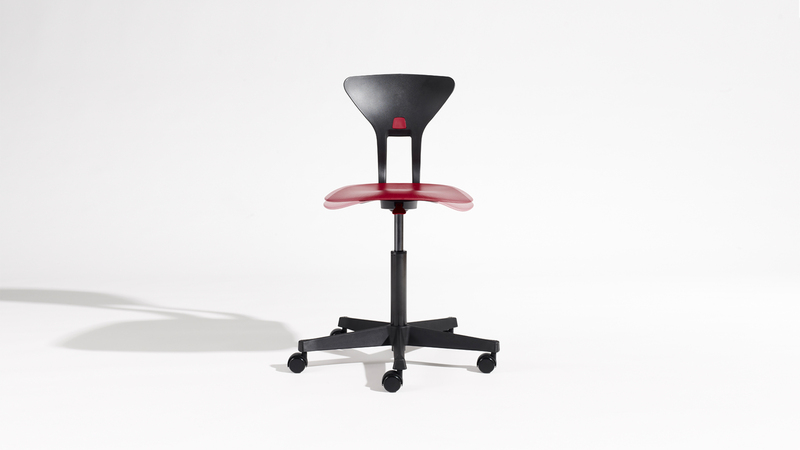 Patented in 2008, the chair has been licensed to leading Danish manufacturer Labofa. It is fast becoming a leader in the Scandinavian market, selling over 12,000 chairs in 2015. The RAY chair has captured the imagination of educators and policy makers and Perch has contributed to the writing of European school furniture standards, using the knowledge and experiences gained from the project. The RAY family is about to expand with the autumn 2016 launch of Junior, targeting the UK, Irish and US markets. The small team at Perch is dedicated to improving the quality of everyday living through design and always strives to find that balance between interactive simplicity, scientific relevance and aesthetic beauty. Specialising in research-led design for Applied Human Movement, Perch takes a truly interdisciplinary approach to critical thinking and problem solving. The team forges long, meaningful relationships with clients that typically last many years; this way of working builds deep connections and enables true, disruptive innovation.